In 2007 Apple changed the smart phone market with the first iPhone. 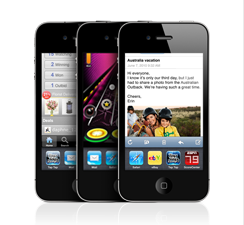 In 2008 they revised the iPhone and rolled out the App Store and developers responded by creating more than 200,000 applications to date. in 2009 the iPhone added video recording, got faster, more memory and a few other new features but nothing earth shattering. Now in 2010 Apple really did redefine the smart phone market again with iPhone 4. The first thing you notice on the iPhone 4 is the weight of the handset when you first pick it up. The weight feels perfect it is more of a substantial tool than just another phone. The glass and metal looks like art, the feel is solid, and it is very comfortable in your hand. The first thing you notice when turning the phone on is the new Retina Display is stunning. The higher resolution and In Plane Switching LED display lights up fast and is very bright even in direct sunlight making it easy to read. The 326 pixels per inch make the pixels so small most people can’t see them and images and text look like laser prints instead of images on a screen. None of the online photos did justice to the clarity of this new display. So far no other smart phone maker is using a screen with this many pixels per inch. Once you swipe your finger to unlock the phone you get a feel for the speed of the A4 processor and the benefit of putting 512 Megabytes of RAM into the phone. While we didn’t see an expected jump in storage capacity the extra speed makes the phone far more capable than it’s predecessors. Even the 3G and WiFi is faster on this new phone requiring you to wait less time to download information and there is plenty of room for network performance to improve as AT&T upgrades its network. Pictures and Video are amazing on this phone putting it nearly on par with higher resolution point and shoot cameras. The 5 megapixel sensor using larger pixels making it more sensitive to light takes great photos in lower light conditions and the bright LED flash on the camera helps with even the lowest lighting situations. More megapixels doesn’t always mean better images just bigger files. The camera can also shoot very clear 720p HD video so you can now leave the Flip cameras at home and use your iPhone to shoot, edit and upload videos right from your phone. If you are going to be shooting longer videos you may still want to bring the FlipHD camera along so you don’t use up all of your storage on your phone. With Music, HD Movies, Data, applications, books, PDF’s and Podcasts it seems as though the 32 Gigs of storage goes pretty quick. The larger battery and more efficient A4 processor has helped the iPhone 4 battery life quiet a bit. Despite the fact I use the phone more and for longer periods of time I can make it through an entire day and not have to recharge the phone. Under very heavy usage on a Friday I got about 15 hours of usage before needing to recharge. Some of that time was a 2.5 hour Plants vs. Zombies marathon. On Saturday I spent a lot of time on the phone and using bluetooth as well as watching videos and showing off the phone to friends and I got another 15 hours of usage and without the gaming marathon the battery still had about 30% charge remaining when I started recharging it. I didn’t get the kind of battery life Engaget described but I had the bluetooth, wifi, 3G all turned on. With a little power management or just recharging while I am in my car or at my desk I don’t think battery life will ever be a problem again for the iPhone. There has been some controversy surrounding the iPhones new antenna built into the frame of the phone and the talked about iPhone “Death Grip” that supposedly makes you drop calls. First I tested this at home with the bumper case removed from my phone and was unable to duplicate the issue. I live in a neighborhood that is close to an AT&T cell tower and I get 5 bars no matter what I do in the house. If I move to a location where I only have three bars and try this I do see a drop in signal strength but I am not sure if it is because of how I am holding the phone or other factors in the environment that might be influencing the phone. This isn’t a new phenomenon. All cell phones loose reception when you cover the antenna with something that can block signals like your hand or your head. To make sure I don’t have a problem and to protect my phones glass surfaces I opted for the Bumper case and in four days of using my iPhone I haven’t had a dropped call yet which says a lot since that has been a problem with AT&T for many years. With iOS 4 on the iPhone we now have multitasking. While for the last couple of years I didn’t think I needed multi-tasking it is again a time saver. Saving the state of the application when I switch to something else and letting me come back right to where I was when I return saves me time in waiting for the application to be ready to go again and doesn’t compromise battery life. Also adding folders allows us to install more applications on our phones without loosing having some applications only available through a spotlight search. Initially the iPhone could support 144 applications. Then iPhone OS 3 came out and we could go up to 176 applications plus the ones that didn’t fit on a screen could be accessed from Spotlight. Now with folders we can have 2,112 applications visible on our phones. Again if you have more than that first of all how do you use them all and second you can find the ones not visible through a folder in Spotlight. The background images you can choose for your lock screen and your desktop really give you something nice to look at while you are using your phone. One of the most compelling and phone new features got a lot of ridicule from the tech and blog community when it was first announced and everyone criticized and said “who would want to video conference from your phone?” But now we have Face Time. While you are on a WiFi network you can call another iPhone 4 user and see them face to face and carry on a conversation with that person. It is great to see someone when you are talking to them and over WiFi the video is clear and the audio quality is excellent. You can even switch from the front to the rear camera at the touch of a button to show the caller what you are seeing or press it again so they can see you. The era of the Jetson’s have arrived. While we still don’t have our flying cars we do finally have an easy to use video chat. Apple has submitted Face Time to become an open standard and already relies on other open standard protocols to work. 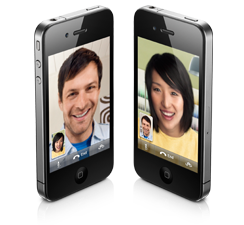 Now Apple needs to make Face Time work not with just iPhone4 but with iChat AV and encourage other vendors like Skype, AIM, Microsoft, and others to adopt Face Time as a standard and use an Open Directory system to allow us to talk with one another. The potential for our communication to be revolutionized if anyone, anywhere and see and hear each other anytime, whether we are at our computers on our desks, our laptops in a cafe, or our iPhones at the beach. To be able to look someone in the eye and have a conversation even if they are thousands of miles away is a very powerful tool. Plus when you look our caller in the eye you know they are paying attention and not distracted by one of the many other devices that now vie for our attention in our lives today. iBooks now runs on iOS4 and on the Retina Display on the iPhone4 it is easy to sit and read a book while having lunch or standing in line. 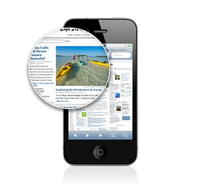 The text is so clear and easy to read even at smaller font sizes it is no problem to look at the screen for long periods. When I got my first Amazon Kindle last year I started reading more because it was easy to carry several books around in a small lightweight device. A year later the iPad was introduced and then I could do far more than just read books and now with the iPhone supporting iBooks I can read anytime anywhere even if I didn’t bring my Kindle or iPad along with me. I can open any electronic book in my library read a few pages and when I get back to my Kindle or iPad they update to the most current page I have read and I can pickup where I left off. Just like with Podcasts, Movies, and AudioBooks on iTunes, iPad, and iPhone. In short the iPhone4 has revolutionized Smart Phones and mobile communications again and it will likely be sometime before handset manufactures catch up to Apple again. By then who knows what will be coming next but stay tuned and we will find out.